It is recommended to leave loan planning until the end when other decisions and predictions are more or less set (expenses and revenues, acquisition of fixed assets, owner contributions to paid-in capital). Business loans should be planned so that cash balances are at least positive during the plan period. - Select one of two worksheets for loan planning. You can select between "Loans" and "Annuity loans". - Select "Cash" in the drop-down menu at the bottom of the worksheet (the cash balances can be viewed as a table or a graph). - Enter the loan conditions. See the pattern of cash balances. This should at least be positive for each period. On the "Loans" worksheet you can enter the receipt of loans, repayments and interest on any selected periods. 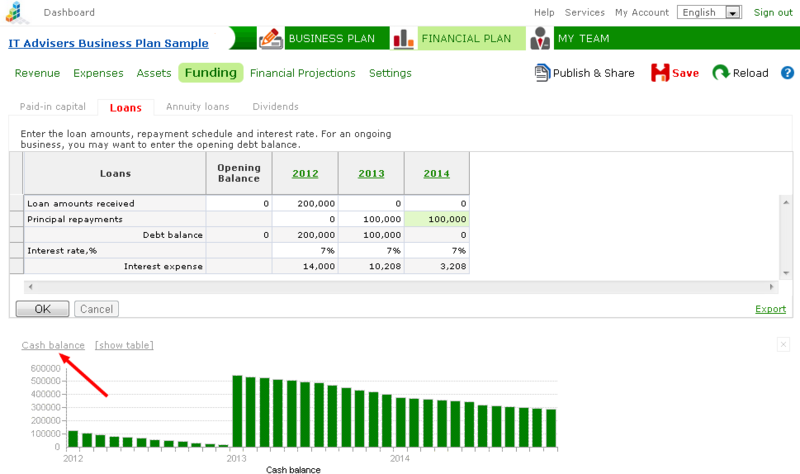 Loan balance and interest expenses are calculated automatically. If you are developing a plan for an ongoing business, you can use this worksheet to record the existing loan balance. Enter the initial loan balance in the "Loan amounts received" row in the "Opening Balance" column. The "Principal repayments" row lets you plan their repayment. The "Annuity loans" worksheet allows you to plan loans in which the payment schedule includes monthly payments of an equal amount. Monthly payments consist of two added components: principal repayment and interest. Enter loan names and terms. Click "OK". Month and year when loan amount is received. (%) Interest rate (on an annual basis). (in months) The period of the loan payment schedule. The schedule may also include a "grace period" (see next). (in months) This is a period in the payment schedule, typically in the beginning, in which principal repayments do not occur, and only interest is paid.